Charlie Bears Bottichelli Discounts Apply ! Designed by Isabelle Lee for Charlie Bears 2017 Isabelle Collection. Botticelli is fully jointed and has been created from a long piled Mohair in vibrant purple shades. A deep purple coloured embroidery thread has been used to create the hand stitched nose and mouth detailing and small eye whites added to create our signature look. 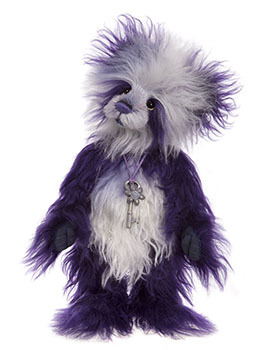 He has flat paw pads which enable him to stand unaided and a necklace and pendant added to complete his design. Limited Edition of 500 worldwide.